PRODUCT: Retro-Spin® / Retro-Collar Kit. 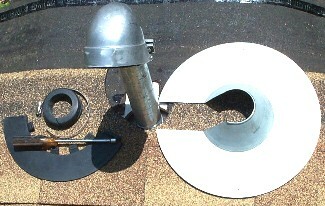 Consists of ASI# 702121 galvanized steel Retro-Spin Flashing base and #702237, 2.375" ID EPDM Retro-Collar Assembly (wrap-around flashing skirt + top plug), and stainless steel band clamp. Fits 2.275 to 2.375 " OD & DN50 Pipes. Price/Kit. #1 Retrofit master flash black EPDM flashing (Aztec #RF101BP). Fits 1/2 to 4 inch Round Pipes. Price/Each.